monaking.co.uk provides a range of professional design services for a wide and varied portfolio of clients. Below are examples of some of our projects. 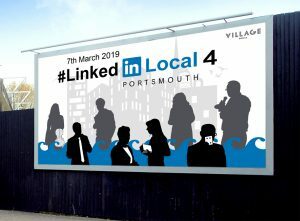 A re-branding project for #LinkedIn Local Portsmouth. The idea is to refresh the branding, illustration and marketing materials. 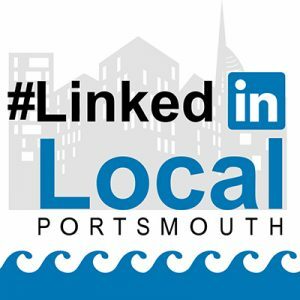 We have created silhouettes of people that have been to previous events, according to the photos taken by the official photographers for #LinkedIn Local Portsmouth. The re-branded images are applied across different social media platforms by the client. 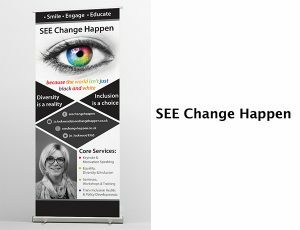 Roller banners design for SEE Change Happen. 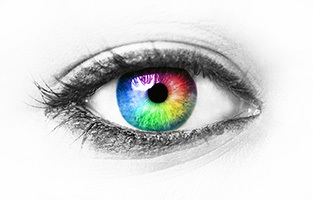 The whole design is mainly in black and white, so the logo (the eye) and the quote “Because the world isn’t just black and white” stand out with rainbow colour. The different shapes and blocks spread out the wordings, so the layout does not look too busy. We designed the A6 flyer and the tri-fold programme/leaflet for Portsmouth Dark Fest 2016 and 2017. 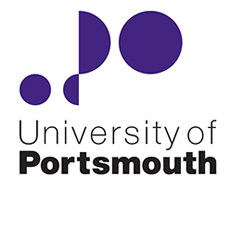 This city-wide cultural festival, sponsored by the University of Portsmouth, explores all things dark and supernatural. We have also created tri-fold leaflet design for UK Hypopressives, we have applied the images with different shapes to make the layout more dynamic. with simple colour blocks to create an eye-catching and elegant style. 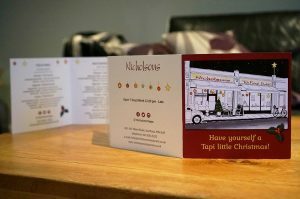 We designed a tri-fold Christmas Menu/Christmas Card for Nicholson’s Tapas Restaurant in Southsea, Portsmouth. We created the simple line drawing of the restaurant from scratch and added illustrations of Christmas decorations with bright colours to create a festive atmosphere. The corporate identity design and branding project for a business and IT consultancy, Spindrift. We have designed 2 logos, submarks and a letterhead with geometric shapes of the compass. The client is looking for something serious but a little bit creative, so we have applied turquoise for the branding, to brighten up the brand identity. 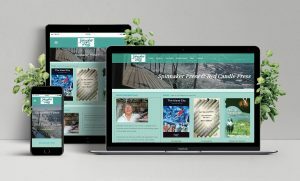 A responsive website designed for Spinnaker Press, a small press set up in 2010 to publish books of poetry and local history about Portsmouth and the surrounding region. The design concept was based around a simple, clear and user-friendly interface that presents and promotes Spinnaker Press’s fascinating books. The first hour is free for web design clients! We help you to set up social media accounts. We can do it face to face if you are local (in the Solent area)! Our design is for everyone! Logo design, web banner design, illustrations, digital art and others. Computers, tablets and mobile phones! 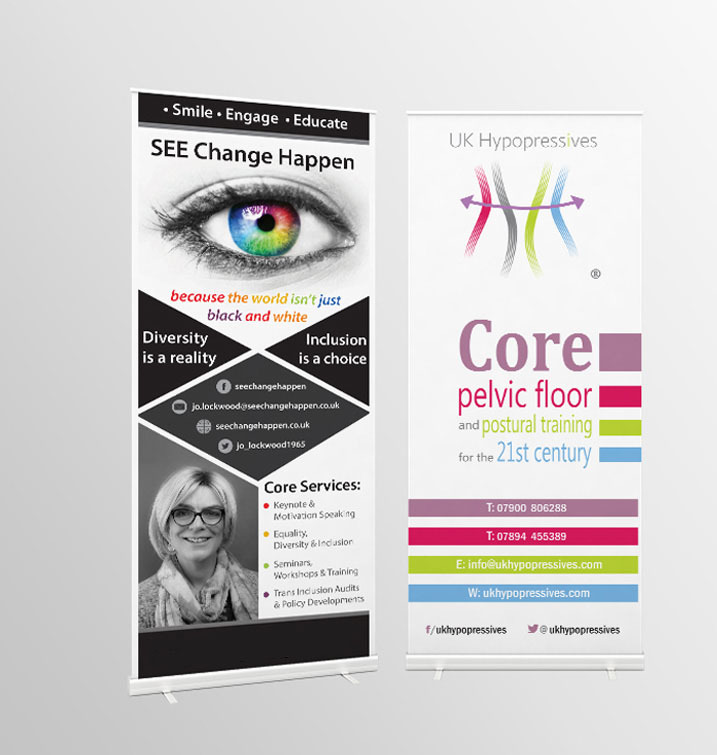 Business cards, roller banners, posters, leaflets, stationery design, labels. Helping you to develop or re-design a corporate identity. Web hosting, domain name, website update & maintenance, SEO, and more…. New!! For web design clients, we provide the first hour social media setup service for free. We are doing promotional bundles which provide different branding and design packages, eg : ” logo + business card + leaflet”, or “business card + leaflet + standard web site”, and etc…. The promotional bundles provide additional value which is particularly ideal for any new business start-ups. Or for businesses that wish to re-design their corporate identity. The promotional bundles provide thorough branding packages which save you time and money. I’ve known Mona for a few Years now and have seen some of the work that she has created on LinkedIn. We were talking at a networking event and discussing the #LinkedInlocal Portsmouth events that I’m involved in hosting. I mentioned that we needed a bit of a refresh of the images that we were using for the event and Mona offered to have a look to see what she could do. The end results of the work that Mona has created are superb. Furthermore the communication and understanding of what we were looking for has been dealt with professionalism and integrity. If you’re looking for some original design work then I would highly recommend having a chat with Mona. Mona’s work for the Welcome Project at Aspex gallery was excellent. 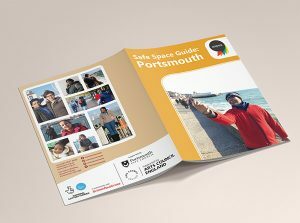 Mona co-lead a 6 week workshop with members of the refugee and asylum seeker community in Portsmouth to helped identify different safe and welcoming spaces in and around the city. Mona designed a guide which outlined all the safe spaces as well as some of the art work and poetry created by the group. Mona was very responsive throughout the project and was very willing to work with the Aspex team to design and edit the guide. The final product was beautifully designed. An overall great job. Excellent work and very responsive. Understood the brief anddelivered exactly what I needed. Very impressed. Thanks Mona. Stuart Grimwood, Spindrift Business Consultancy ltd. I met Mona via a network event last year and we have been in touch ever since to discuss working together. Mona has showcased her work at the meetings and she always comes highly recommended by others that I know so I knew when I needed a new business card rebrand design that I would hire Mona as I love her passion and visions she has in her work. After a variety of conversations with Mona asking questions to understand my business and my vision she researched some designs to see what I liked and gave her honest opinion as to which would work best for me. 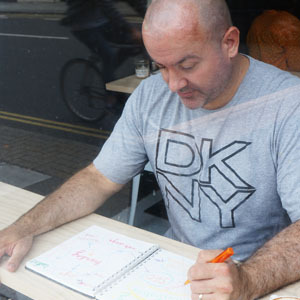 After a few days she produced a fantastic design and captured everything that was in my head and my personality whilst still keeping to my brand. I highly recommend using Mona for any graphic design work and will not hesitate to pass her details on. Thank you so much. Mona has done a total branding redesign for us: logo design, colour scheme, business card, a responsive website. We are extremely impressed with Mona’s creativity and her knowledge in graphic and web design. She gave us very thorough advice, to make our branding consistent and standout. She also helped out with GDPR and SEO on our website. We would gladly recommend her services. We were very happy with Mona’s great design she did for us. She was very enthusiastic and came up with some great ideas. She produced some great work in a short amount of time. I would highly recommend her work and dedication. 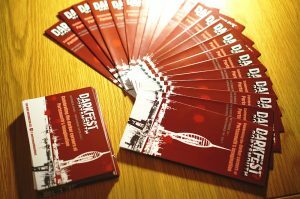 We were delighted to work with Mona King again on this year’s Portsmouth DarkFest promotional material. Her designs are always innovative and perfectly attuned to the themes and mood of the festival. 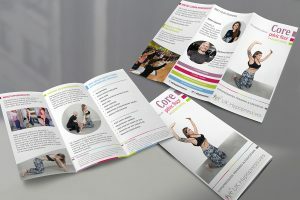 She was responsive to the ideas behind the design brief, and provided us with a rich range of creative options and formats. We are very proud to have her design work representing the public image of DarkFest 2017. 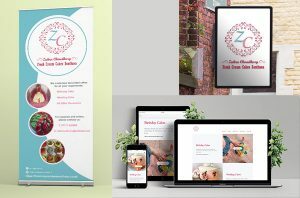 From simple certificate design to banners and everything in between Mona is a pleasure to work with.  She is very honest and extremely experienced in her field and has consistently produced awesome designs for our growing company. Thank you Mona you are a breath of fresh air!